The latest YouTube leaks of the 10.1 affirm some of these specs along with a surprising phone dialer. In the leaked footage, the 10.1 is seen with a Telcel wallpaper. Telcel is a Mexican Telecom. The phone dialer and the Telcel promotion gives some indication that the device will support mobile broadband and possibly the ability to make phone calls. However, U.S. consumers may have to hold their collective breaths on whether the U.S. variant of the Galaxy Note 10.1 will come with these features as well and whether it will actually come shipped with an Exynous quadcore chip. 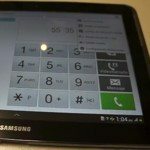 The Samsung Tab 7.7 model, for example has call and dial features and an Exynous chip for its international variant. The U.S. variant was locked down and only came with a Texas Instruments OMAP cpu due to LTE compatibility issues. Calling features have been locked out on the U.S. version as well.